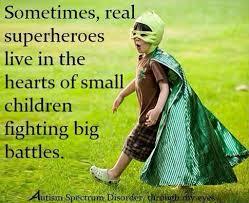 Children with special needs and learning differences do have to fight big battles every day. They are trying to relate to a world which often does not make any allowances for their differences. A world where they are seen as strange and not accepted. They struggle to engage with the lessons that are presented to them in the classroom. Their learning styles or best way of accessing the material may not be taken into consideration. The pace at which the material is presented may be too fast and not repeated enough for them to be able to process it. They may have sensory needs and sensitivities that are impacted. They can be distracted by a noisy classroom or the noise itself can be painful for sensitive ears. They may struggle to answer questions when called upon because it takes them a longer time to formulate their response. They may prefer to work alone but are often required to work in groups where there are demands for social skills that they lack, and with other children who are more naturally adept in group interactions. They may need down time, sensory breaks, and just plain time alone to regroup, recharge, and not be given those breaks. With all the stresses that are not understood by others, kids can start acting out and have meltdowns. Their behaviors are not understood or easily tolerated by the other kids and the teacher. So that causes them to stand out again as different or strange. That is what I call bravery. This entry was posted in Blogging, Current Issues and tagged ADHD, Autism, Blogging, Courage, Learning Disabilities on March 11, 2015 by Deborah Drucker. Thanks for a very important post Deborah. I wish we knew better how to help these children. I at least wish we could figure out how not to make matters worse for them. Our schools don’t seem to understand. Thanks Dan. We do know some things that help like Universal Design and Co-teaching which is where Special Education teachers work with General Education teachers. Some schools are better than others at this. The Common Core Curriculum pressures have not made things easier either. Our local school system is moving toward a competency-based grading system which relies heavily on self-assessment. I worry that these kids will have more opportunities to slip between the lines. If the kids have to do some type of self-assessment that could be hard. Love to read positivity! kids with different learning abilities arent Disabled…they are differently abled and I for one would like to see teachers better trained to work with their uniquness! Me too. There are some well trained teachers but there is a lot of pressure to keep up the fast pace with all the testing and rating of schools according to student test scores. All children are different and don’t learn the same way. It’s sad to see when any struggle to keep up. I was a visually impaired student, in need of an IEP and for some allowances to be made for me in the classroom. Luckily I received a lot of assistance and I survived, but it wasn’t always easy. My parents were amazing and advocated for me the entire time and I had good people fighting for me and teaching me, for the most part. Great that you took the time here to write a post about this.